I hope you all enjoyed your weekend! This post was suppose to go up yesterday but for some reason my Firefox was not cooperating with the Blogger website. In any case, my weekend has been out of sorts to say the least - my family came down with the 24 hour stomach bug(those pesky daycare germs). DH got it first, then it hit me Friday night, and Saturday I think LO came down with mild case. We've been laid up all weekend, sleeping and eating bagels and soup. Hopefully we'll be right as rain by the time my brother arrives mid week. While making the bagel run, I realized that there was a Sally's enroute so I dropped in quickly to take advantage of the FingerPaints 2 for 1 sale going on all month long. I picked up two and I have one of them for you today. Sally's is also running their 50% off red tag sale this weekend, but all the good polishes were picked over at my store. I was more interested in the FingerPaints anyway, and luckily they had some good colors for me to choose from. I have a silver polish called Chromatic Creation, and the formula on this was smooth and easy to control. I used no basecoat in these pics, and you can see the underlying imperfections of my nails. It was opaque in two coats, but I did three for extra coverage on my longer nails. No topcoat in these pics. But wait, is that a prismatic rainbow I see in the last pic? Could this be a holo in the new FingerPaints core line? Why yes it is! Let's check it out under direct light, shall we? ZZZzzzzzz..... Oh, sorry, I didn't mean to snooze there. What were we doing again? Oh yes, looking for the holo in Chromatic Creation. If you look hard enough, it's there, albeit very weak and subtle. In the day and age where indies rule the scene with amazingly strong holos in all colors and finishes, this doesn't even begin to compare. I do appreciate that a salon brand made an attempt at a holo, and made it part of the core line at that. I suppose this would be a wonderful surprise for a muggle who decides to pick up a seemingly plain ol' bottle of silver polish, but for us polish enthusiasts, it's a disappointment to say the least. The price is the only plus, costing only a little over $5, and half that if you manage to pick up during this month's BOGO sale. I'm hoping that I can still salvage this polish for stamping. Would you consider adding this to your collection? Well the holo is weak but it's still a pretty polish! It's definitely pretty! I'm not sure I need another silver polish in my collection though. I use Firefox with Blogger also and it NEVER posts automatically when I schedule it. I've tried to schedule posts many many times and have yet to see this feature work. Very frustrating! I've gotten it to schedule posts, but I couldn't get it to load at all, and I oftentimes have trouble with uploading pics via Firefox. Google Chrome works in a pinch when the other is cooperating. I wish I used it more! 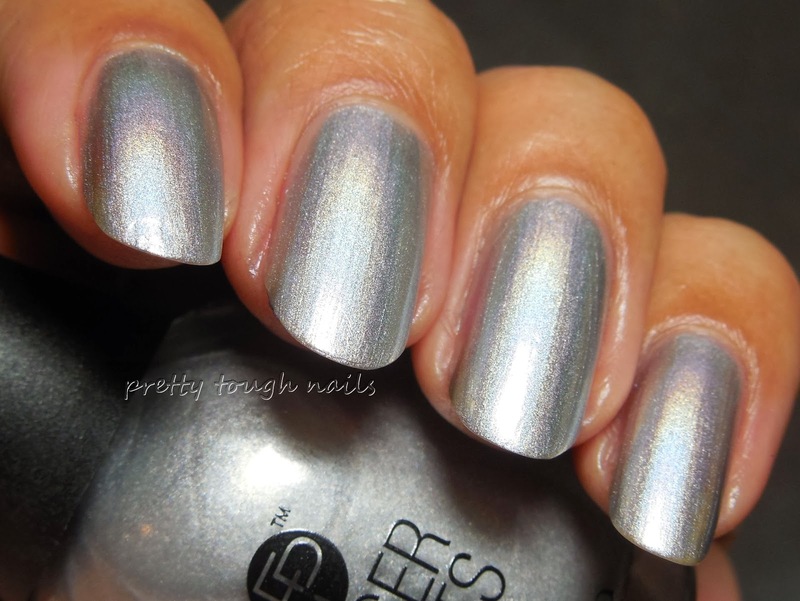 This is a pretty color but I agree, the holo effect is kind of disappointing. I think it's still a pretty silver and I'm sure it would look great used as a stamping color.